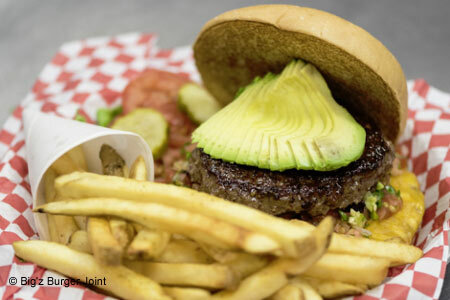 Big’z sports a swing-set-friendly environment but offers big-boy burgers and fries with chef-driven sauces. : Local über-chef Andrew Weissman (Osteria Il Sogno) is the creative force behind this family-run and family-friendly burger joint where yellow walls rise from terracotta-stained concrete floors, and corrugated metal competes with wooden picnic tables topped with butcher paper. More straight-on chic are the Angus beef burgers that can be accessorized with provolone and blue cheese, beer-braised onions, apple wood-smoked bacon and more, including the fried egg that makes the burger “dirty.” There’s also a chalupa burger on a shell with refried beans, cheddar, pico de gallo and a half-pound of beef. We find the burgers fine enough, but it’s the seasoned fries with inventive dips that have us hooked. Consider the sweet potato version, and note that Big’z is a place where chili cheese fries might even be desirable, though the Cobb salad is surely less lethal. Double-thick milkshakes, including double-dutch chocolate, are challenging in their density, so a little melt-down time is advised. A fudge pecan brownie is another dessert option. There’s also an outpost at 10106 Hwy. 151 in the Sea World vicinity, 201-543-2029.